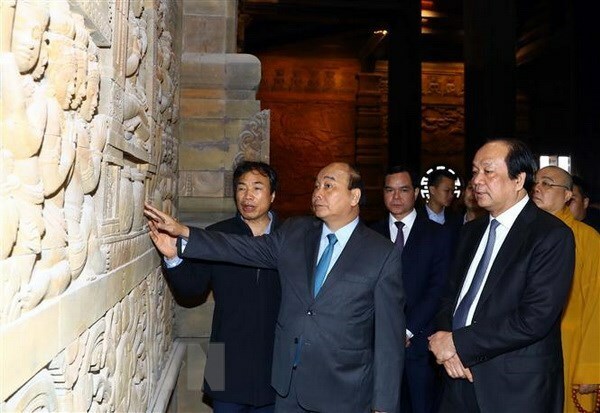 Hanoi (VNA) – Prime Minister Nguyen Xuan Phuc has inspected the preparations for the United Nations (UN) Day of Vesak 2019 at the Tam Chuc Buddhist Cultural Centre in Ba Sao commune, Kim Bang district of the northern Ha Nam province, the host of the event. The construction of the Tam Chuc Buddhist Cultural Centre has been stepped up recently so that the facility can be completed before the UN Day of Vesak 2019, which is slated for May 12-14. The UN Day of Vesak 2019 expects over 10,000 participants, including 1,500 dignitaries, monks, leaders of Buddhist organisations, scientists, and researchers; as well as Buddhist followers from 90-100 countries and territories all over the globe; along with 10,000 Buddhist followers and locals of Vietnam. PM Phuc asked Ha Nam and the project’s investor to ensure the project’s progress. Although Vietnam has successfully hosted the event twice before in 2008 and 2014, the country should be careful in preparation work, ensuring the success of the UN Day of Vesak 2019 and in leaving a positive impression among foreign friends, the Government leader stressed. “Vesak”, the Day of the Full Moon in the month of May, is the most sacred day to the millions of Buddhists around the world. It was on the Day of Vesak two and a half millennia ago that the Buddha was born. It was also on the Day of Vesak that the Buddha attained enlightenment, and it was on the Day of Vesak that the Buddha in his 80th year passed away. The UN General Assembly recognised internationally the Day of Vesak in 1999 to acknowledge the contributions that Buddhism, one of the oldest religions in the world, has made for over two and a half millennia and continues to make to the spirituality of humanity.